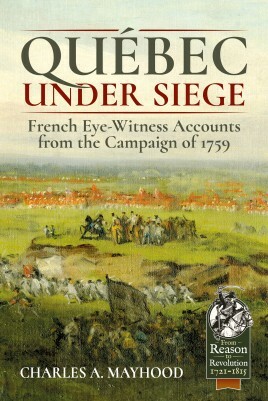 Late in the summer 1759, Québec, the capital of New France, was under siege. British Major General James Wolfe had the city surrounded and cut off from reinforcements in Montréal, Vice Admiral Charles Saunders was in firm control of the rivers surrounding the city as well as the supply routes into the region. The French population found itself low on food and ammunition to defend themselves, and suffering daily bombardment by the English. The walls of Québec were manned by militiamen and sailors taken from French ships lost or anchored above the city for their protection. Lieutenant Général Louis-Joseph de Montcalm-Grozon and his aide-de-camp Louis-Antoine de Bougainville commanded the French regulars outside the city, moving them in rapid deployments to counter the British advances. Here the story is told by the citizens within the walls: an artillery captain, a prominent citizen, the emissary traveling between the British and the French commanders, and a Catholic nun working in the main hospital, treating the sick and wounded of both armies. Three of these works are offered in English for the first time, and all four are fully annotated. These journals and memoirs bring us inside the siege, allowing us to watch through their eyes as the fate of New France was determined. Raised in the shadows of Fort Ticonderoga and Crown Point, Charles Mayhood, BSEd, is an independent researcher and historian focusing on the first person journals and memoirs of those who witnessed the events from Albany, New York, to Quebec City during both the French & Indian and Revolutionary Wars.